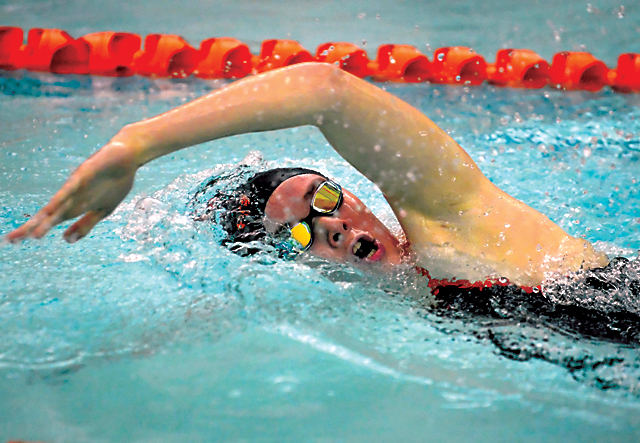 02/11/19 Mirror photo by Patrick Waksmunski / Tyrone's Fiona McConnell swims the 200 freestyle. TYRONE — The Tyrone Area High School boys and girls swim teams both improved to 8-1 Monday night, thanks to a sweep over Marion Center. On the boys side, the 400-yard freestyle relay team of Jacob Decker, Parker Bayard, Hjalte Skov and Songmian Wang broke a 24-year-old school record by winning in 3:32.92. That helped the team to a 99-71 win. Double winners included Wang (200 IM, 100 fly) and Decker (50 free, 100 back). On the girls side, Tyrone won, 122-48, behind double wins from Madison Coleman (100 free, 50 free), Fiona McConnell (200 free, 100 breast) and Sarah Hoover (500 free, 200 IM). 200 medley relay: 1. Tyrone (Decker, Lenze, Wang, Bayard) 1:53.64; 2. Tyrone (Skov, Yaudes, Maceno, Gregg) 2:04.85; 3. Marion Center (Crooks, Urbani, Farmery, Tonkin) 2:13.70 ; 200 freestyle: 1. Scott, MC, 2:03.49; 2. Lenze, T, 2:11.25; 3. Maceno, MC, 2:17.85; 200 IM: 1. Wang, T, 2:15.79; 2. Vaglia, MC, 2:24.75; 3. DelBaggio, T, 2:39.11; 50 freestyle: 1. Decker, T, 23.87; 2. Bayard, T, 24.23; 3. White, MC, 24.65; 100 butterfly: 1. Wang, T, 57.24; 2. Vaglia, MC, 1:07.90; 3 Farmery, MC, 1:16.61. 100 freestyle: 1. Skov, T, 55.07; 2. White, MC, 55.82; 3. Maceno, T, 1:02.12; 500 freestyle: 1. Clark, MC, 5:57.82; 2. Gregg, T, 6:10.33; 2 DelBaggio, B, T, 7:18.66; 200 free relay: 1. Marion Center (Vaglia, Scott, Clark, White) 1:46.14; 2. Tyrone (Yaudes, Maceno, Gregg, Lenze) 1:50.30; 3. Marion Center (Tonkin, Crooks, Short, Smith) 2:00.73; 100 backstroke: 1. Decker, T, 1:00.44; 2. Bayard, T, 1:04.50; 3. Scott, MC, 1:07.07; 100 breaststroke: 1. Lenze, T, 1:13.24; 2. 3. DelBaggio, T, 1:18.26; 3. Clark, MC, 1:20.15. 400 free relay: 1. Tyrone (Decker, Bayer, Skov, Wang) 3:32.92; 2. Marion Center (Vaglia, Scott, Clark, White) 4:06.06; 3. Tyrone (Irvin, DelBaggio, Gonder, McCracken) 4:42.68. 200 medley relay: 1. Tyrone (Decker, McConnell, Coleman, Hoover, S.E) 2:03.63; 2. Marion Center (Schults, Dehaven, Gardner, Ryer) 2:13.38; 3. Tyrone (Reese, Daugherty, Maceno, Baran) 2:19.21; 200 freestyle: 1. McConnell, T, 2:14.19; 2. Hoover, S.M, T, 2:25.75; 3. Blystone, MC, 2:34.47; 200 IM: 1. S.E. Hoover, T, 2:30.83; 2. Baran, T, 2:41.47; 3. Schultz, MC, 2:46.38; 50 freestyle: 1. Coleman, T, 25.65; 2. Decker, T, 28.22; 3. Focht, T, 29.65. 100 butterfly: 1. Reese, T, 1:14.59; 2. Dehaven, MC, 1:20.03; 3. Gardner, MC, 1:20.42; 100 freestyle: 1. Coleman, T, 56.55; 2. Baran, T, 1:05.67; 3. Manna, T, 1:06.02; 500 freestyle: 1. Hoover, S.M, T, 6:33.13; 2. Smith, MC, 7:23.60; 3. Urbani, MC, 7:36.60; 200 free relay: 1. Tyrone (Focht, Manna, Baran, Reese) 2:00.04; 2. Tyrone (Maceno, Martin, Oakes, Walk) 2:08.39; 100 backstroke: 1. Decker, T, 1:07.19; 2. Schultz, MC, 1:08.82; 3. Reese, T, 1:12.14; 100 breaststroke: 1. McConnell, T, 1:15.84; 2. Hoover, S.E., T, 1:16.80; 3. Dehaven, MC, 1:20.98; 400 free relay: 1. Tyrone (McConnell, Hoover, S.E., Decker, Coleman) 4:16.70; 2. Marion Center (Dehaven, Krecota, Ryer, Schultz) 4:42.75; 3. Tyrone (Manna, Diebold, Walk, Oakes) 4:43.17. STATE COLLEGE — Nate Fisher’s pin capped a five-match run, and the Golden Tigers came back from a 34-14 deficit to trim State College, 36-34, in high school wrestling. Sam Haines and Weston Barnes also had pins for Hollidaysburg. 182–McClaughlin, SC, won by forfeit; 195–McCready, H, maj dec Beebe, 12-4; 220–Urbas, SC, pinned Dellinger, 2:38; 285–Haines, H, pinned Schoen 2:32; 106–Weaverling, SC, pinned Adams, 1:59; 113–Swisher, SC, pinned Smilnak, 2:59; 120–Praul, H, maj. dec. Krick, 9-1. 126–Leidy, SC, maj. dec Simpson, 13-2; 132–Woolcott, SC, won by forfeit; 138–Bridenbaugh, H, dec. Martin, 10-7; 145–Sleeth, H, maj. dec. McShea, 10-0; 152–Barnes, H, pinned Kandemir, :30; 160–Walls, H, dec. Price, 2-1 OT; 170–Fisher, H, pinned Lose, :46.